In his role as Director of Client Services, Gary provides oversight to Client Services Team at Quick Med Claims. Client Services works closely with QMC’s partners to ensure that their needs are readily addressed. The CS Team also provides ongoing support to the QMC Account Managers and Billing Directors in exceeding client expectations. 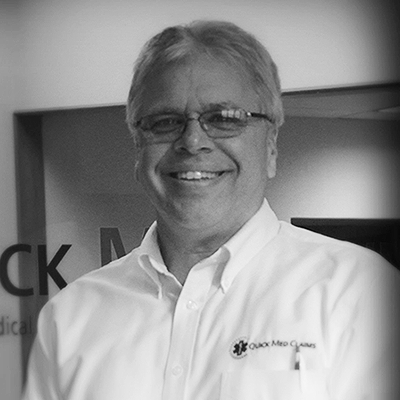 Gary has over 40 years in emergency medical services and knows both the operational and financial side of the EMS industry well. Previously, Mr. Harvat served as the General Manager of HC Global handling all administrative level activities including contracts, project oversight, personnel management, and marketing. Mr. Harvat grew the company by building a public safety customer base given his long-standing background in emergency medical services (EMS). Between 1982 and 2010, Gary worked with the West Penn Allegheny Health System, directing multiple departments, including emergency medical communications, pre-hospital services, air medical (LifeFlight), security, outreach and patient transport. He also served on a number of internal hospital committees and chaired the hospital’s Emergency Response and Disaster Operations Committee for many years. Gary’s background includes pre-hospital experience beginning in the mid-1970s. Gary was one of the many contributors to Pennsylvania’s original EMS Act in the 1980s serving on several workgroups. Gary long-served as a paramedic but is no longer active in delivering direct patient care. Over the years, Mr. Harvat has spoken at regional, statewide and national EMS Conferences on varied topics including priority dispatch procedures and his hospital’s experience with the timely pre-hospital management of ST-Elevation Myocardial Infarction (STEMI) patients.